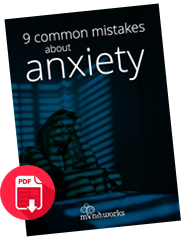 Discover 9 mistaken beliefs about anxiety & 3 things you're doing to make it worse. Do you have a feeling of nervousness and worry about something that may or may not happen in the future? Are you feeling stressed? Problems sleeping? Afraid or suffering panic attacks? Smoking, drinking or eating for comfort? Avoiding people or situations? If so, you need to read this! - in this free eGuide.